British walkers spent more time on foot than anyone else in Europe in 2016, according to statistics from outdoor discovery app, ViewRanger. The statistics analysed by ViewRanger – which allows walkers to plan, navigate, record and share all of their outdoor adventures – included data from millions of walking routes recorded by app users throughout the year. Covering a distance of 8.1 miles at a speed of 2.6 miles per hour, on average Brits like to get out for 3 hours 4 minutes on each walking trip. Slovakian walkers by contrast spent just 2 hours 17 minutes on average, on each trip. 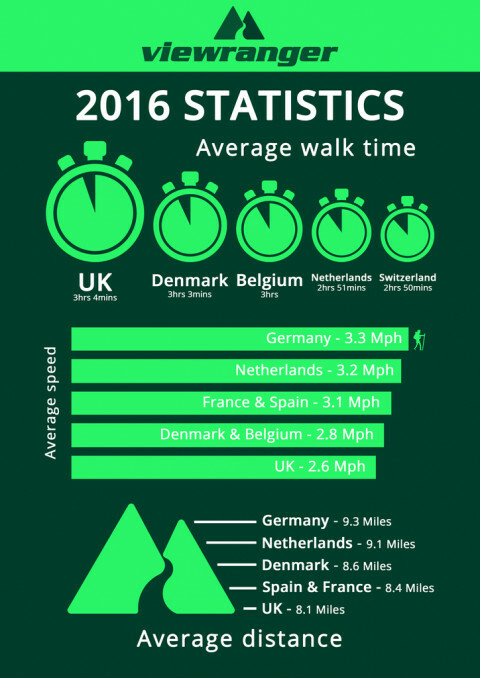 German walkers proved the fastest covering an average of 9.3 miles at 3.3mph while American walkers appear to take a more leisurely approach than any in Europe, travelling at 2mph and covering 8 miles. The results follow the launch of ViewRanger’s 2017 Outdoor Challenges, designed to inspire people all over the world to step into a healthier new year. The Challenges will see walkers, cyclists and runners complete between 250 and 6,000 miles throughout 2017, using the app to keep track of their mileage and share their adventures throughout the year. As well as helping outdoor enthusiasts to record and share their stats for each trip, ViewRanger contains free offline maps and more than 150,000 downloadable route guides that offer inspiration for walking trips in the UK and abroad.